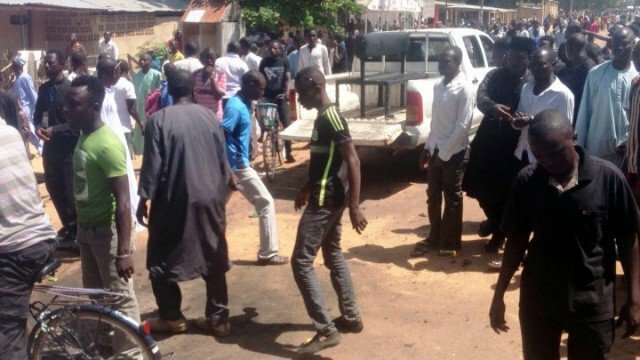 A suicide bombing at a school assembly in the north-eastern Nigerian town of Potiskum has killed at least 47 students, police have said. The explosion at a boys’ school in Potiskum is believed to have been caused by a suicide bomber dressed as a student. The militant group Boko Haram is believed to have carried out the attack, police said. The group has targeted schools during a deadly five-year insurgency aimed at establishing an Islamic state. The explosion ripped through the assembly hall at the Government Science Secondary School, reports say. Soldiers who attended the site of the explosion were met with fury by the assembled crowds who pelted them with stones and accused them of not doing enough to halt Boko Haram’s insurgency. The state is one of three in Nigeria that have been placed under a state of emergency as a result of the group’s activities.